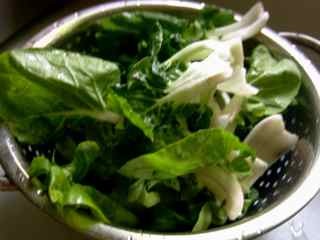 In Northeast cuisine, ‘You cai’ are normally stir fried or cooked in the soup on its own, or with other ingredients, like, mushrooms, flat ‘Fen si’ (potato starch), or fish balls, but never with any meat. In contrast, the ‘small bok choy’ goes well with meat balls, beef or lamb mince balls, or in hot-pot. Fish balls are a ‘new thing’ in Northeast cuisine. They only started becoming popular around 15 years ago, maybe. They can be made from different kinds of white fish, commonly used only in soups. I guess it is a type Cantonese and Japanese food. Here in England, I can only find fish balls in Chinese supermarkets, and they usually are ‘cuttlefish balls’. They are normally sold in two types: fried and non-fried, both are good for stir frying or soup. Personally, (with my greedy stomach) I like fried ones, but, did I mention before that I got influenced by dad, who never trusts the oil that used to fry food sold in the market. So, I tend to only buy the non-fried ones, and if I like, I can fry them at home. But for this recipe, I do think non-fried ones are better. 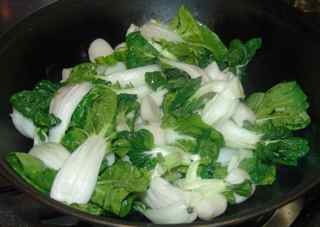 ‘You Cai’ (Bok Choy) – you need a big bunch of it, because after heated up and mixed with salt, it ‘shrinks’. 2) Halve the fish balls into half (This is only because the fish balls I got is not very small). 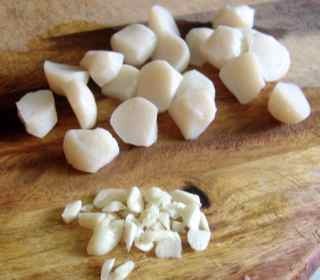 3) Chop 3 -5 gloves of garlic. 1) Pour in 4 -5 tablespoons of oil into a heated wok. 2) When the oil is heated up, put in chopped the garlic, and 1/3 teaspoon of five spice powder (optional). 3) When you can smell the garlic, add the fish balls in, stir fry for a little while. 4) Add in prepared ‘You Cai’, stir fry together with fish balls. 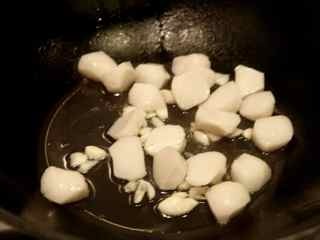 5) Add in 1/2 teaspoon of salt, 1 tablespoon of soy sauce. The leaves, especially the white part of the stem should still be very crunchy and juicy.